Setting up your nursery room can be an overwhelming task as there's so much you'd need to do. Moreover, you're stressed as you want it to be "the best". A few tips to help you out. Setting up your child's nursery room can turn out to be a really hectic and stressful time for you as a parent, especially if you're a perfectionist. You should know that it's not really all that hard and hence we're here to guide and take you through the entire process one step at a time, so that by the end of this article you'd know exactly what you need to do in order to give your child a grand entry into this world. There are times wherein we have a choice when it comes to the room we pick for our nursery. If you're one of those lucky people, make sure that you pick a room that's close to your own bedroom. More importantly, it needs to be on the same floor as yours. You don't have to complete decking the entire nursery in a single day, take it one step at a time and you'd enjoy doing it. To top it up, you won't be stressed out. Don't worry about specifics, your child isn't going to complain if the room has pictures hung at an angle rather than perfectly straight, they'd just love looking at them - pick something colorful so that their minds can get to work the moment they begin to see the world in colour. Fix your budget and then begin the plans as you wouldn't want to end up spending more that you can afford. The wise old saying goes: "Safety First" and that's exactly what we're going to be doing today. Have you child proofed your babies room? If you haven't already done it, this is what you're going to need to accomplish first. Electrical Sockets - Of course your child is going to be in his or her crib and not walking around during the first few months of their life and this isn't that important a priority. But, most parents fail to get this job done later on and it can turn out to be injurious. Therefore, ensure that each of the sockets in the room have a cover. You wouldn't want your child poking fingers into the socket. Sharp Corners - There's not much that can be said here as you already know what to do in this case. 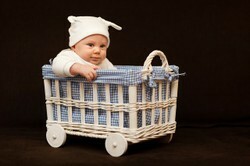 Buy baby furniture that's passed the standards and hence is certified as "baby safe". What about a gate? - Once your child begins to walk they're going to be running all over the place. If you've got stairs inside your home, you're going to want to make sure your kid doesn't leave their room, you could build a small gate just like that of a play pen at the door. You'd be able to step over it, but your child won't be able to climb over. The first thing that you'd need to do before you purchase any baby furniture would be to measure the nursery room as you would want to know exactly how much space you've got and the dimensions of the furniture needed in order to have sufficient moving space. The best thing to do is write it all down on a piece of paper and put it into your purse or wallet as you're going to need it when you go furniture shopping. There are times when you're out and you just think of going shopping as you've got the time, you wouldn't have to go back home just to fetch the dimensions. Even better if you could save it on your phone. Personally I'd suggest you use Google Keep as it's great for making notes, setting reminders etc. The Crib - As far as possible place the crib as close to the entrance as you can, because you'd be coming into the room at night when your child cries and it would prevent you from tripping on toys on the ground. Also you would want to avoid placing it near the window as drafts are bad for your child. Changing Table - The changing table must be placed close to the crib as far as possible because that would save you the effort of carrying your child all across the room in case of a diaper change. Rocking Chair - If you either purchase a rocking chair or a recliner you would want to place it near your window as you'd love the breeze when rocking your child to sleep. You may also spend a lot of your time in the room and a lovely scenery wouldn't hurt. Shelves and Cabinets - Plan a lot of storage as your child is probably going to need much more than you assume. Another important point that I'd have to stress on is the positioning of shelves - Never place any above the crib as there's a risk of things falling on your baby. It's finally time to get to the most delightful part of this guide - decking the nursery! There are plenty of ways to go about decking the nursery. Some parents prefer to buy offline so that they can actually see and feel the furniture, whereas there are others that would rather save time and purchase online. One way to save you a lot of cash would be if you purchase a nursery package rather than individual items as stores offer discounts on such orders. Pick the furniture colour based on the theme of the room, if you don't already have one - think of one before you place an order. When buying a crib see to it that the slats are vertical as it will prevent your child from climbing up and trying to get out. Also, they should be closely spaced as kids usually get their heads, feet or hands stuck between them. That's it... Your baby nursery is not set. You can go ahead and decorate the room by adding pictures and one of those rotating toys above your childs crib too. Don't forget to decorate the ceiling too as your child is going to spend most of their first few months lying on their back staring up at the ceiling. Some luminescent stars for the night would be really cool. Looking for the perfect name for your new baby? A guide to choosing the right baby name including all the pitfalls and traps to avoid. Such a beautiful poem, evoking pretty images of a bright colorful garden. Sadly the true story behind Mary, Mary Quite Contrary is horrific.